P.S. 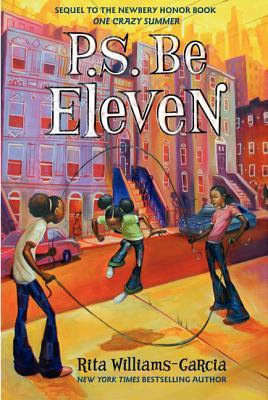 Be Eleven by Rita Williams-Garcia. Grades 5-8. Amistad, May 2013. 288 pages. Review copy provided by my local library. After spending the summer with their activist poet mother in Oakland, it's hard for Delphine and her sisters to adjust to their old lives. Especially when Papa brings a new lady-friend around, Delphine gets a surprise new teacher, and the Jackson Five are sweeping the nation. Everywhere she goes, Delphine feels in-between. Not an adult (or even a teenager), but no longer a child, either. Now this is a tween story. Delphine is nothing if not "between". Used to being in charge of her sisters, Delphine is forced to give up some of her control when Vonetta is chosen to be in charge of the sisters' savings for the Jackson Five concert. Even though Delphine has to start dealing with some adult situations - namely her uncle's struggles after coming home from fighting in Vietnam - her mother insists that she "Be eleven" in every letter she sends. Delphine's figuring out how to fit the black power teachings of last summer into her life. Tall and gangly, Delphine is the tallest girl in her class (taller than most of the boys), but her grandma still insists on dressing her in childish outfits. Rita Williams-Garcia gets the setting just right, placing readers in late 60s/early 70s New York City. The way Delphine and her family and friends talk gives the setting authenticity without being over the top or confusing. Williams-Garcia also deals with the effects of the Vietnam War in a child-friendly way without shying away from real situations. A character "gets sick from drugs", but there's no depiction of actual drug use. You're going to want to read the award-winning One Crazy Summer first, but it's okay if you've read it several years ago (like I did). P.S. Be Eleven stands on its own to a certain extent. For more books about the African-American experience around the Civil Rights era, try The Rock and the River by Kekla Magoon. This story deals with the conflict between nonviolent and violent protests during the struggle for Civil Rights. You also might try The Watsons Go to Birmingham - 1963 by Christopher Paul Curtis. This is another family-centered story about African-Americans and Civil Rights. For readers who like the strong urban setting, try Hold Fast by Blue Balliett (a contemporary mystery set in Chicago) or When You Reach Me by Rebecca Stead (a historical mystery also set in New York City). P.S. Be Eleven is on shelves now!